Some experts say Governor Jerry Brown’s pledge for a zero-emissions state by 2045 won't be possible without rethinking the entire industry. At the outset of last month’s Global Climate Action Summit in San Francisco—even before the release this week of a dire U.N. climate report—California Governor Jerry Brown made a bold announcement, setting a target for the state—the world’s fifth-largest economy—to achieve net zero emissions by 2045. Brown has signed a number of bills spelling out how California might achieve its goal, including SB100, which commits the state to 100 percent carbon-free electricity by 2045, as well as a series of bills intended to increase the adoption of electric vehicles. But missing from the flurry of legislation are concrete plans for the future of food and agriculture. California began investing in agricultural solutions to climate change four years ago, using revenue from the state’s cap and trade program. Since 2014, the state has spent more than $180 million on four climate-smart agriculture initiatives, permanently protecting nearly 80,000 acres of farmland, and funding 735 on-farm projects. It’s a good start: the on-farm projects alone are estimated to collectively eliminate 42 million metric tons of greenhouse gas emissions, while saving more than 28 billion gallons of water. Yet funding for these programs has been unstable, and advocates say far more investment is needed. 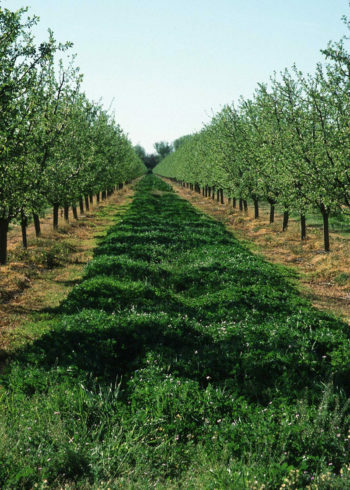 In theory, California agriculture could sequester more carbon than it emits. But some advocates say that would require a fundamental shift away from chemically supported monocultures and confinement livestock operations. So far, the state has had little appetite for taking on these large agricultural interests, but with this new net-zero emissions target and a new governor taking office next year, deeper changes to the state’s food system might just be on the table. To understand why agriculture is critical to climate progress, it helps to understand a little bit about carbon. This abundant element passes through rocks, soil, plants, the ocean, the atmosphere, and our own bodies in an elegant cycle that maintains the planet’s relatively stable climate. Since the industrial revolution, people have gradually disrupted that balance by releasing carbon into the atmosphere through deforestation and burning fossil fuels. Slowing these two climate-warming activities is crucial to restoring some balance to our planet, and that’s mainly what we’ve heard about over the last two decades of high-stakes climate summits. Globally speaking, the food and agriculture sector is responsible for a large share of these greenhouse gas emissions: between 19 and 29 percent. Industrial agriculture uses a lot of fossil fuel (particularly for inputs like fertilizer), and has also driven deforestation, while livestock and their manure release methane, another problematic greenhouse gas. In California, agricultural emissions make up just 8 percent of the total greenhouse gas footprint. This figure is a little deceptive, though, given that Californians import a large share of their climate-intensive foods (particularly meat) from other places. But what makes agriculture so important to climate progress isn’t so much the degree to which it’s adding to the problem—it’s the unique potential this sector has to contribute to the solution. While sectors like energy and transportation can help slow the tide of emissions, agriculture can act as a carbon sink, and actually put carbon back in the ground. In the past few years, California has emerged as a global leader in tackling climate change through agricultural policy. One of its most successful programs to date has been the State Water Efficiency Enhancement Program, known as SWEEP. The first program of its kind in the country, SWEEP provides financial incentives to farmers to improve irrigation management in ways that both save water and reduce emissions. So far, the greenhouse gas emissions reductions the program is projected to achieve over its lifetime are equivalent to taking nearly 65,000 passenger vehicles off the road. However, state funding for the program hasn’t kept up with farmer demand. In the first three years, applications outnumbered awards by a nearly three-to-one ratio. And since drought faded from the headlines, funding for the program is in question. Similarly promising, but struggling, is another first-of-its-kind climate-smart agriculture program: The Healthy Soils Initiative. This initiative offers financial assistance to farmers for a whole suite of practices that sequester carbon in soils, from reducing tillage to planting perennial vegetation to adding a thin layer of compost to the land. 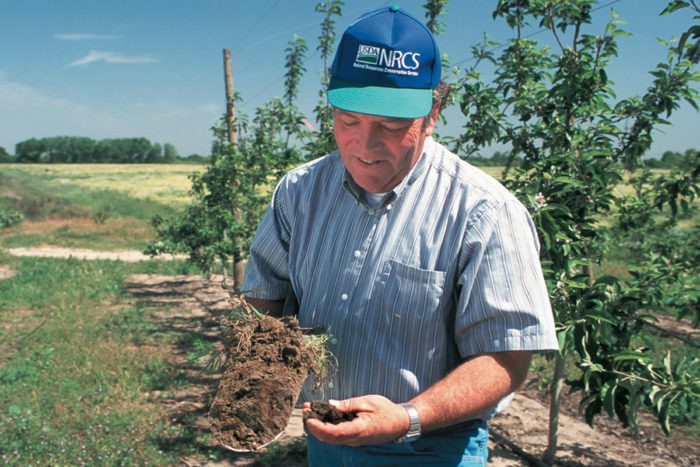 Although small, this program has been celebrated far beyond California as a particularly promising win-win policy, since carbon sequestered in soils not only reduces the burden on the atmosphere, but actually improves soils’ fertility and capacity to support healthy crops. Renata Brillinger, executive director of the nonprofit California Climate and Agriculture Network (CalCAN), says the Healthy Soils Initiative is critical to jumpstarting carbon farming because it “de-risks these transitions” for farmers who would otherwise have to make the up-front capital investments themselves. 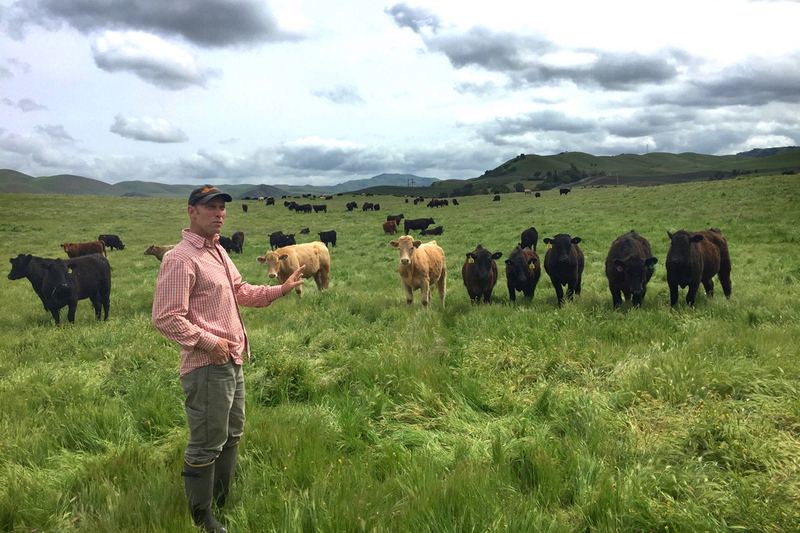 Once farmers get started with carbon-sequestering practices, Brillinger says, they begin to see the benefits to their soil fertility and their bottom line and then sharing their successes with their neighbors. It’s a powerful ripple effect. Like SWEEP, however, the Healthy Soils Initiative also saw its budget zeroed out in 2017-18, then restored in FY 2018-19, but not at a level sufficient to meet demand. Organizations like CalCAN are fighting to keep those programs alive. Supporting on-farm improvements to irrigation and soil health practices is important, says CalCAN’s Policy Director Jeanne Merrill. But all these efforts to improve the climate performance of farms will be moot if we keep losing farmland to development. “California is losing an average of nearly 50,000 acres a year of agricultural land,” says Merrill. She points to a 2012 UC Davis study that compared the emissions of an acre of urban land to an acre of irrigated cropland. The urban land emitted 70 times more greenhouse gas than the cropland. Equally critical to supporting farmers in making climate progress, both Merrill and Brillinger believe, is ensuring that they have access to technical assistance. But institutions like the University of California’s Cooperative Extension service and the statewide Resource Conservation Districts—which have been helping farmers improve soil health since the 1930s Dust Bowl—have yet to recover from budget cuts imposed in the 1990s and 2000s. There was good news on this front during the Global Climate Action Summit: The state announced 10 new extension positions specifically focused on helping farmers mitigate and adapt to climate change. But more promising still, Brillinger and Merrill say, is a bill just signed by Governor Brown, in the wake of the summit. AB 2377 will dedicate a small portion of the state’s climate-smart agriculture funds to a technical assistance grant program, prioritizing smaller farms and socially disadvantaged farmers. “We have to invest in outreach and education, farmer-to-farmer led education and demonstration projects. This is what is going to move the needle,” says Merrill. Why hasn’t California set a straightforward target for reducing agricultural emissions, the way it has for electricity? For one, “natural systems don’t perform in as consistent and predictable ways as combustion engines and solar panels,” Brillinger explains. “They are highly variable and subject to changes in management practices, as well as unforeseen and unpredictable events like droughts and forest fires.” So far, these challenges have kept the state from setting a goal, but that might be about to change. Earlier this year, a group of state agencies released a draft concept paper, proposing to reduce natural and working lands emissions by 15 to 20 million megatons—essentially cutting current emissions from this sector in half. Merrill thinks this target is way too low for a sector with potential to sequester more carbon than it emits. And she’s not alone. Merrill pointed me to a letter that a group of scientists from UC Davis, UC Berkeley, and CSU Monterey Bay sent in June to the California Air Resources Board, saying that the emissions reductions target should be more ambitious and that the state’s baseline data was flawed. Amélie Gaudin, one of the scientists who co-authored the letter, has become a staunch believer in the importance of a firm target for emissions reductions on agriculture and natural lands. But she didn’t start out that way. Now a professor of agroecology at UC Davis, Gaudin originally hails from France, so she was watching closely when her home country rolled out a similar target during the Paris Climate Conference three years ago. Dubbed four per mille (4 per 1,000), the initiative proposes a global effort to add carbon to soils at an annual rate of four parts per thousand. Four per mille’s scientific team believes this rate of carbon sequestration would offset the increase in carbon dioxide in the atmosphere related to human activities. Gaudin was delighted to see California and France announce a new Global Soil Health Challenge partnership at the Global Climate Action Summit, building on the four per mille target. She is still a stickler for accurate models, though, and is keen to see California’s model put within proper parameters for the state’s climate, rather than importing assumptions from the Midwest, where many U.S. agricultural models are developed. She’s also doing research to understand which kinds of agricultural practices can store the most carbon. But equally important, Gaudin says, is to understand which practices growers are most willing to adopt, and which strategies maximize co-benefits to the environment and their farm operations. Kari Hamerschlag, deputy director of the Food and Agriculture Program at the environmental nonprofit Friends of the Earth, has been working on climate change and agriculture issues for over a decade now. Even more challenging than the models and modalities, Hamerschlag says, are the politics. Hamerschlag has been frustrated to see that climate-smart agriculture dollars haven’t been spent on conversion to ecological farming practices—but rather toward investments in large-scale equipment that she worries will further entrench industrial monocultures. According to a recent CalCAN report, the same year that SWEEP and HSI were zeroed out, the state allocated $600 million to priorities of conventional agriculture trade associations, including farm equipment upgrades, dairy digesters, and food processor energy efficiency programs. The dairy digesters, in particular, have spurred vigorous debate about the goals of the state’s climate-smart agriculture programs. Two-thirds of all emissions from California agriculture come from the dairy and livestock sector, evenly split between methane from cow belches and methane from manure. The state has recently taken aggressive steps to try to bring down the manure-based emissions, passing the country’s most ambitious legislation on this issue two years ago. The new law, SB 1383, requires California’s dairy and livestock industries to curb methane emissions 40 percent by 2030. But the law doesn’t say how they have to do it, which leaves the California Department of Food and Agriculture (CDFA) to decide how to split a limited pool of funds to help dairies convert. That’s why CalCAN has instead focused its energies on something called the Alternative Manure Management Program, or AMMP. 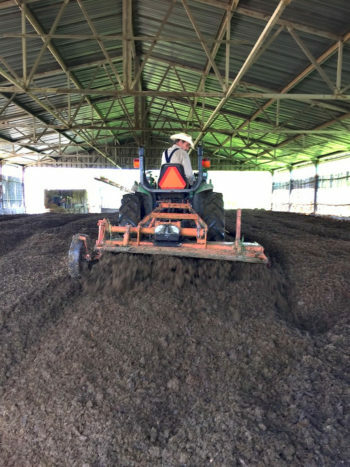 This program helps farmers transition from wet manure handling—methane-spewing slurries—to dry manure handling strategies like composting, solids separation, or keeping livestock on pastures where their manure can decompose naturally. Hamerschlag admits that she hasn’t gotten much traction with agricultural policymakers on targets for reducing livestock herds. But she thinks there’s another way to tackle the problem: from the demand side. Hamerschlag has also been cooking up other climate-smart changes to school lunch, working with the Oakland Unified School District, that have made a quantifiable difference when it comes the district’s carbon footprint. Now Hamerschlag is working to extend these practices to other schools and public institutions, and she’s excited about a new law recently signed by Governor Brown that requires plant-based options in prisons and healthcare facilities. If there’s one thing that everyone working on climate change and agriculture in California agrees on, it’s that isolated, incremental approaches are no match for the task ahead. Deep emissions reductions won’t come from tweaking existing farming systems, but from dramatically shifting the mix of what we grow, and where and how we grow it. While these kinds of transformations—things like integrating crops and livestock, incorporating trees on farms, or replacing synthetic fertilizer with cover crops and compost—are a heavier lift than installing a dairy digester, they come with significant co-benefits. Brillinger and Merrill see some opportunity for integrated solutions simply by better connecting the dots between existing programs. For example, many crop farmers have been applying for Healthy Soils Initiative funding to apply compost. Meanwhile, livestock farmers are applying for AMMP funding to compost their animals’ waste. It might behoove the state, they suggest, to set up a matchmaking service. As for the execution of Governor Brown’s target, that remains an open question. As the Brown administration wanes, the implementation phase will fall to the next governor. Executive orders aren’t binding like legislation, and this one was vague and aspirational. But the impact has nonetheless been strongly felt in Sacramento, Merrill says, and the world is watching. State assemblymember Jacqui Irwin, coauthor of AB2377—the state’s newly signed technical assistance bill—agrees. The state needs to encourage modular thorium molten salt power reactors sited off the coast seaward of offshore wind farms. Floating reactors are zero CO2 emmission, have no land costs, and can provide base load to replace fossil fuel generation. What fantastic, important work you are doing! Congrats! Last year I co-produced Locally Grown, America's Food Revolution, a local PBS film on how Humboldt County are doing it right in terms of food production. We could not put everything we are doing in our area in the film, but it gives you a taste of the positive things going on in our food world. We are in the process of raising another $300K to do a national PBS. You should be able to download the film from our website, and it not let me know, and I will send you a DVD. Nice article, Liz! Really thoughtful, not too optimistic nor pessimistic. And you spoke to so many of the key leaders in this issue statewide. A lot of work went into this piece, and I hope it's widely read. I do wonder, what can other states learn from CA in this regard? I’m heartened and excited to see the beginnings of change in farming methods. At last we’ll be working with the Earths living systems, and not against them! This article really encompasses the full range of issues around efforts to improve soil health as the fundamental engine of smart climate change adaptation and prevention. As a California native, I care about all the losses I’m seeing to wildfire, and I have long hoped the dairy industry and irrigated agriculture would step up to the challenge of reducing their carbon footprint. As a Soil Scientist, my life’s work has revolved around organic matter, its benefits to soil ecosystems. All across the country and in the Pacific Islands I have seen farm soils degraded by conventional processes. Your article has clearly described the way back. Consumers don’t just have to look on and wish for change. Their choices at the market are important, but much more important than that is to practice agriculture directly, on their apartment balconies and windowsills, in their backyards, and Local-ize the very food they eat, using these principles.